If there is one thing that I have learned from Penny Experiment, it is that I will never pay more than $1 for a box of cereal again. In fact, I won’t even consider buying cereal for Penny Experiment unless I can figure out how to get it for $0.50 a box or less. The reality is that with a bit of knowledge and using coupons, it’s not nearly as difficult to do as you might imagine. This purchase took a little creativity to get done, but it should be a system that I can use over and over again. CVS doesn’t usually have the best prices when it comes to the marked price, but when combined with the other offers they have, the price of the food can come down significantly. This is what I did. 2. 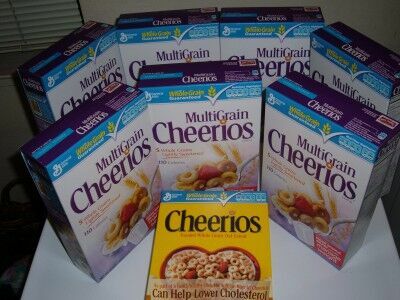 I had coupons: General Mills is sending out $1 off box coupons when you sign up at their site. I had $1 coupons that I could use. 3. I had a store coupon: I live in an area where drug stores abound and the competition is high. I can usually find a $5 off any purchase of $20 or more. These three combined made for a great deal. The $1.99 a box was an average deal, but nothing I would ever buy. Add on the $1 off coupon and it brought the price down to $0.99 a box — a good deal, but still too high for me to buy. Add in an extra $5.00 off for a purchase of $20 or more and there are some real savings (this is called “stacking coupons”). To make it work, I needed to add something else to reach $20 (the 8 boxes only added up to $15.92 at their $1.99 a box price). Luckily, CVS had some body soap at $4.99 with $4.00 back making it only $0.99. Add in a $0.75 off coupon I had and the price was $0.24 plus tax, but it make it possible to get that extra $5.00 off. I included that in the cost of the Cheerios since I needed it to make the deal work, but I will also be donating the body wash to charity as well. This entry was posted in Coupons, Donated Food, Penny Experiment and tagged 90% savings, Cheerios, couponing, food bank, great deal, multigrain Cheerios, super couponing, using coupons. Bookmark the permalink.